The Kegco SD-7340J 7 Gallon Wide Mouth Glass Carboy allows you to brew up to 6 gallons without having to worry about the kraeusen clogging up your airlock on big beers. This carboy is constructed of glass and features a smooth surface that does not easily scratch making them easy to sanitize and without harbor bad odors or flavors. The jar has a wide opening that makes it easy to reach inside the jar to add and remove ingredients or clean every inch of the inner surface. 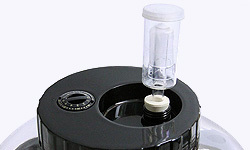 Carboy comes equipped with a silicone seal in the plastic lid that creates an airtight seal on the jar and you can install an airlock in the recessed area on the lid to release gasses during fermentation. 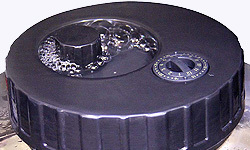 By installing the included breather cap and filling the recessed area with sanitizer, gas will bubble out without letting in oxygen or other contaminants. Carboys can provide decades of great performance if you handle them with care because they do not break down like plastic carboys or buckets. 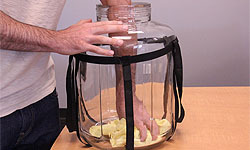 Transportation of the glass container is uncomplicated thanks to the included nylon strap handles. 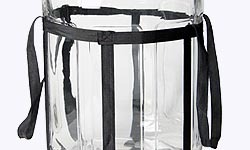 The glass jar is less likely to get scratched up than a plastic carboy or bucket, so these jars are already easy to clean, but the wide mouth makes it even more convenient than a normal carboy. The wide opening allows you to easily stick your whole arm inside the vessel to reach all of the surface area with a cleaning cloth, ensuring bacteria has no place to hide. 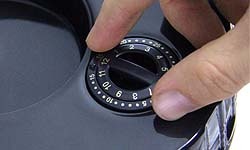 The removable cap on the lid allows you to install a drilled #3 rubber stopper with your own air lock so the gas can vent without allowing in oxygen. When using this jar as a fermenter, gas will be released from your brew. If the vessel were sealed airtight, the added gas could cause the jar to explode if not vented properly, but if there is not a good seal, your brew could be come oxidized.